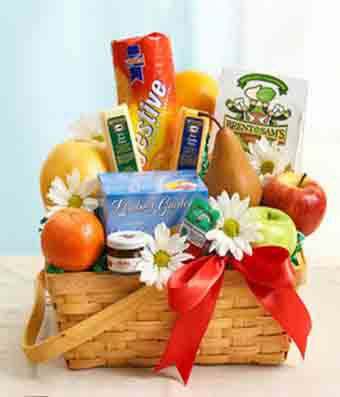 Sending the Fruit and Gourmet Basket is a genuine gesture toward friendship and warm-heartedness. This aesthetically pleasing gift is overflowing with fresh fruits, sausages, cheeses, crackers, and fresh flowers. To top it all off? A pretty red bow! Send today for same day delivery to your recipient. Make them smile! Please note: contents may vary.